I am Dr. John Turner. I live in Hamilton, New Zealand. I should explain that the title ‘Dr.’ is not for Medicine, but for Mathematics. Two different kettles of fish. You can see from the photograph that I am a senior citizen. I have decided it is time to begin writing my autobiography, to discover from my memories some of the paths and passions that I have explored on my long journey through life. I shall be entering each successive chapter, as it is written, into the Web site. This plan will give me a good incentive to keep writing. And interested readers will be able to sample chapters, and hop from one to the other as they wish. My plan for writing the autobiography began in year 2003. I regret that progress halted in 2004, after only two chapters had been written. I hope to get it moving again soon. You will find the two chapters in the Autobiography Page, plus one or two other bits and pieces, written in preparation for moving the project onwards. I am still, at the age of 83, ‘doing mathematics’. Pause for advice to reader: … If you really want to enjoy Mathematics, you must ‘do it’. That means, don’t just read about it and try to memorize bits of it. Start sucking your pencil, and trying to solve some of the problems you can find in your maths books; the more the merrier. Better still, try to invent your own mathematical structures, and develop your own methods to study them. You will immediately generate a list of problems, your very own, which require solving. Now, that sort of activity is what I mean by ‘doing mathematics’. I can assure you, that the day that you find a nice result (doesn’t have to be too abstruse or deep, and it very probably won’t be! ), and the day that you first write down your very first theorem and proof, all your own work, will be one of the most memorable days of your life. Big adrenaline rush … marked with self-amazement and pride. From time to time I shall include other than matters biographical. 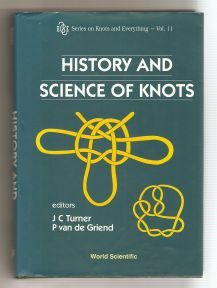 For example I want to tell you about work I have done in knot and braiding theory. And I shall be offering a CD which has on it four volumes (1600 pages) of braiding methods — theory and diagrams — devised by a colleague of mine called Georg Schaake. He produced all that material in the last 30 years or so. A truly monumental work! This site is the only place you can read about his life and work. Follow The Braider Journal link to get to his page. The heading is a bit of a misnomer because no-one has life-long interests! What I mean is that there are several interests that I have steadily developed over the years, sometimes working on them like crazy, sometimes dropping them for a while and returning to them later, all the time trying to improve my knowledge and skills on each of them. I want to tell you about them. Refresh my life to myself at the same time. Here are the main ones that have occupied me, from about ten years of age down to the present 79 something years that I have now accrued. There is a baker’s dozen of interests. Oops! I have missed one. I have spent (maybe misspent) many years trying to learn a handful of foreign languages. They have kept me busy and happy throughout the years. I haven’t included those deeper, larger interests … seeking love companions, having a family, raising five (four) children, watching my grandchildren grow up … since they will all emerge in the autobiographical pages. Over time, I will take each of the thirteen interests, and write brief notes about them, to explain some of my feelings and achievements in them.